​All your IT management and support needs for a flat monthly fee. ​Now more than ever, businesses are focused on controlling costs, preventing loss of productivity, limiting downtime, increasing efficiency, and reducing risks. Managing your own IT systems can be a time-consuming and distracting experience. 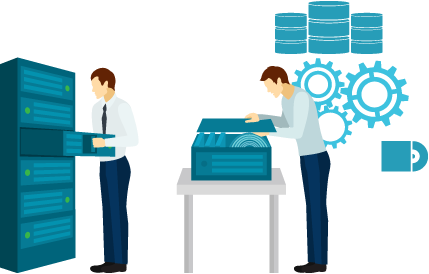 Take the guesswork out of managing your IT needs and let The Mobile PC Guys handle the load with our Managed IT Support solution. Responsive - when you call, we answer; when you need us on site, we get there -- fast! If you are taking care of your IT, then who is taking care of your business? The Mobile PC Guys will proactively manage, monitor, and update your desktops and servers from our centralized remote support center. Our 24/7 monitoring methods enable us to block threats, push critical software updates, and identify and fix potential issues—providing overall security and ensuring maximum “up-time” across your entire network. Don’t let their technical savvy and high IQs scare you. Our helpdesk technicians are personable, responsive, communicative, and some of them are downright charming! Just call us at 731-588-4200. Most of the time you’ll hear a “real live” human on the other end ready and willing to assist with your computer, network or server issue. You can also create and track “trouble tickets” via our easy-to-use Client Portal. Shortly after submitting a request, you’ll get a response (either a cheerful phone call or friendly email) notifying you of our plan to address the issue, and by when you can expect to hear from a technician. If you’re on the road or away from your regular computer, just fire off an email to helpdesk@themobilepcguys.com. Include all the relevant details and contact info, and we’ll get on it right away! For issues that cannot be diagnosed or resolved remotely, we’ll schedule a site visit from one of our field technicians. You’ll also receive regular visits from a The Mobile PC Guys field engineer to perform any routine services that require a physical presence. For after-hours simply call our main phone number 731-588-4200. We have on-call technicians 24 hours a day, 7 days a week (including weekends and holidays). As a true technology resource partner, your success is our success. Whether your business is moving fast, currently in cruise-control, or completely changing gears we’ll help you make the most of whatever stage of development you’re in. Leveraging technology to help you run faster, smarter and cheaper is what we love. We’ll meet regularly throughout the course of our relationship, keeping you abreast of relevant industry trends and tools to help you achieve business goals. While a great deal of our services center around the proactive management and support of your networks and systems – maximizing “up-time” so you can concentrate on your core business – we believe the success of our partnership should also be measured by the strength of our relationship. This starts with healthy, proactive communication. Note – All Computers & Servers MUST be included. We do not accept Flat Rate Maintenance Agreements for some parts of a network, it's all or none. Also all computers and servers MUST have our Pro-Active monitoring and maintenance software installed. Software Updates other than Microsoft Software, Java, and normal operating system software. Equipment not covered under agreement. Malicious or Intentional Network Activity by Client or their staff. I have 26 desktops and 2 servers, Can I just cover 10 desktops and 1 server on the Flat Rate SLA? No, with Flat Rate service it's “All In”. We tried this in the past and the logistics were a nightmare for both us and the client. I am located outside your service area, can I still get a Flat Rate SLA? No, because some of the tasks we provide, requires our technicians to come onsite. So we only provide this service within our service area. So all my labor is covered if I have a problem? Yes, the Flat Rate SLA will cover all normal maintenance, repair and most other types of labor with the exception of the items listed on the pricing page. So can my employees just call in when they have a problem? Yes, they can call our office, submit a service ticket or call the Emergency Hotline depending on their service needs. What are the benefits of a Flat Rate SLA? IT expenses are just a part of doing business these days so with a Flat Rate SLA you are able to budget your IT expenses from year to year without surprises. If I have a problem, you will come right away? It depends on the type of problem, service calls are triaged based on the impact the issue is having on your network or business. For example if you have a computer that is having problems connecting to a printer, your call may be behind another client that has a complete network outage. As I add more computers to my network, does my monthly amount go up? Yes, as you add to the network, we ask that you call us and add the new equipment to your list of assets we keep on file. What if I don’t like the Flat Rate SLA? You can cancel anytime with a 30 day notice, we don’t believe in long term contracts. We believe in earning your business every month. I have multiple locations, do I need a separate Flat Rate SLA for each location. We can combine all locations under one agreement or set up and agreement for each location. It's really up to you.